ServicePower Technologies Plc (AIM: SVR), a market leader in field management software, today announced it has been named by Frost and Sullivan as a member of a select group of field service management vendors that have made the leap to proactive, preventative field service capabilities combining M2M and robust scheduling and mobile capabilities. 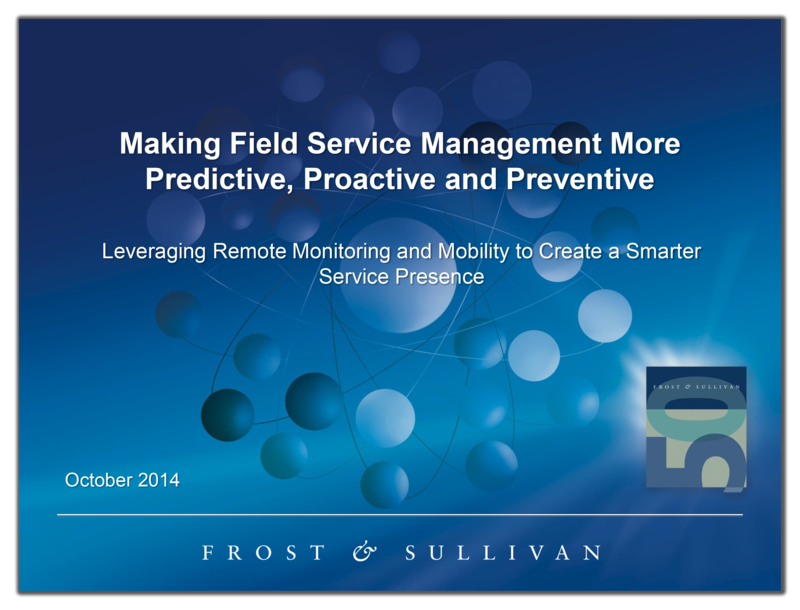 In its report, Making Field Service Management More Predictive, Proactive and Preventative- Leveraging Remote Monitoring and Mobility to Create a Smarter Service Presence, Frost and Sullivan explores the field service management market’s steady progression from reactive to real-time proactive service and support. ServicePower’s M2M Connected Services enables its clients to gather equipment sensor data from connected machines, wirelessly transmit the information to ServicePower, and then instantly schedule a repair appointment using ServiceScheduling or ServiceOperations. In the case of ServiceScheduling, each field resource’s schedule is optimized, in real time, producing the least costly, most efficient, and most productive blend of appointments, complete with the tools and parts needed to complete the repair in one trip. ServiceMobility provides the on-site field technician with the information and collaboration tools necessary to ensure the job is completed to the customer’s satisfaction, the first time on-site. ServiceOperations, with its thousands of connected 3rd party contractors can provide the same seamless service experience to customers in areas or which require skills not managed within our client’s employed workforces, and can be intelligently utilized in conjunction with employed field technicians using Smart Scheduling Broker. However, M2M Connected Services takes it one step further. Using the M2M sensor data, as well as manufacturing data, ServicePower is able to model equipment failure, producing maintenance schedules which clients can utilize to ensure the highest levels of equipment uptime. When a field service organization is able to get to a product before it fails, the results are reduced labor costs, improvement in first-time-fix rates, increased revenues from maintenance contract sales, and higher customer satisfaction due to fewer equipment breakdowns and faster trouble resolution. ServicePower provides field service management software that enables the evolution to true proactive maintenance service models.